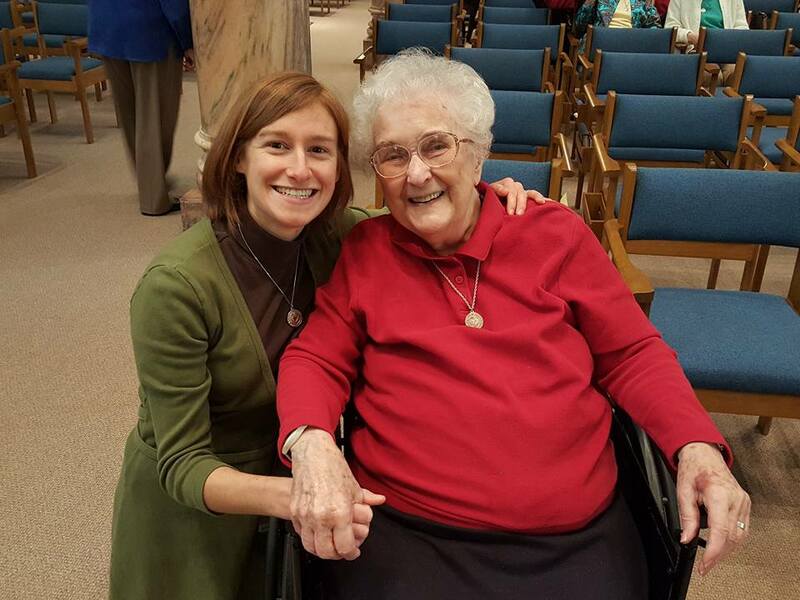 This describes the opening scene of any (of my many) visits to S. Annina Morgan, a beloved Sister of Charity who went home to God earlier this year after 102 years of faithful discipleship on this earth. The visit would continue with S. Annina inquiring about everything happening in my life, and the two of us delighting in each other’s presence. I always felt like I was someone special after a visit with Annina. After her death, many stories were shared, and it turns out my experience of Annina was not unique. She had a way of making everyone who encountered her feel like someone special. How did she do it? I believe Annina knew what it meant to be real presence. My memories of S. Annina re-surfaced in my heart recently after returning home from my annual retreat; a week of sacred solitude in the peaceful woods of Nerinx, Kentucky. I can best describe my week as an experience of, and a call to be, real presence. Although I was physically alone most of the time, I was very aware of the Trinity as my divine retreat companions. At times I imaged three distinct persons with physical features; and at other times I imaged more of a vibe or energy – like the way it feels when you are in a bustling kitchen with family or friends preparing for a special meal. The sound of chatter, laughter and clinking glasses; the aroma of delicious food; and the feeling of joy and belonging while experiencing table fellowship. I find it fitting that Andrei Rublev’s icon The Trinity depicts the divine community as gathered around a table – real presence to each another. The Trinity is one of my favorite images of God – God’s very existence is community. The power of community is that the whole is greater than the sum of its’ parts. That is because something more is creating between the individual parts: relationship. It is one thing (and an important thing) to recognize Christ in everyone we meet; but when our presence to the other is real, we help to create a fuller image of God by the relationship between us. As Catholics, we proclaim and embrace the Real Presence of Christ in the Eucharist. When we commit to becoming what we receive, it means more than just being Christ alone in the world; rather it is a commitment to being Christ in relationship to others, to become real presence in the world. I live with three other Sisters of Charity in the neighborhood of East Price Hill on the west side of Cincinnati. It is a neighborhood both rich in diversity, and in need of a little extra love and care. We were thrilled to move into the neighborhood, but after a few months we began to ask ourselves, ‘How can we be a more positive presence in this neighborhood?’ – after my retreat experience I think I would re-word the question, ‘How can we be a more real presence in this neighborhood?’ Inspired by the concept of the Little Free Library, we decided to install a House of Prayer at the base of our driveway. With the construction skills of my dad, and the wood burning artistry of one of our sisters, we have a beautiful little house along our heavily-traveled sidewalk where folks are invited to write their prayer requests. After its installation, we waited and wondered, would anyone write? Within the first 24 hours the first request came, ‘please pray for my grandma’. Every day since, the prayers have continued, ranging from prayers of gratitude, to pleas of desperation for freedom from drug addiction. We continue to be awed by the willingness of our neighbors to be vulnerable and to share their most intimate prayers with us. Each day we collect the little slips of paper out of the pray house and read them aloud during our community morning prayer. It has helped us to become more aware of the real presence of real people in our neighborhood. We hope that our neighbors are more aware of the real presence of our prayers for them. God is more than the Spirit dwelling within us; God is also the relationship that we create between us. May we be Real Presence in the world. 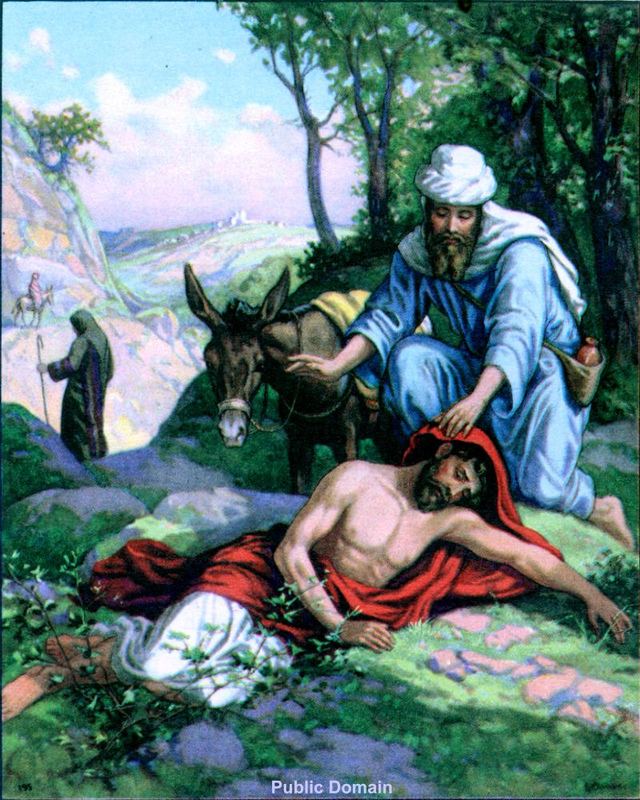 In last Monday’s Gospel (Luke 10:25-37) a lawyer asked Jesus, “Who is my neighbor?” Jesus’ response told the parable of the Good Samaritan then asked the lawyer about who was neighbor to the man who was beaten. 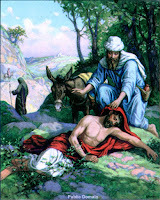 The lawyer replied, “The one who treated him with mercy." Then Jesus said to him, "Go and do likewise." My parish’s pastor gave the homily, explaining that during Jesus’ time a neighbor was thought of as anyone who lived in your faith community. Father proceeded to explain that what Jesus was calling his followers to, and now us to today, was a broader idea of neighbor as including Gentiles (non-Jewish people). For today’s interpretation this would include non-Christians: Muslims, Hindus, Atheists, etc. Today in a world that is so divided along so many lines this call to “Go and do likewise” is more needed than ever. We are called to look beyond labels and see our neighbor no matter what and respond in mercy. For me that call does not just apply to my ministry to people coming home from jail or prison but to my own Sisters as well. At times I only see the little foibles that annoy or anger me and not my Sister or neighbor who is worthy of mercy and love. However as a follower of Christ I am called to see all of his loved ones as he does. 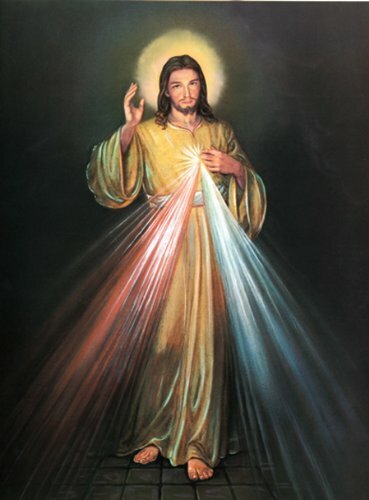 When these times of shortcomings occur, I beg for our Lord’s’ mercy through prayer and the Sacraments. Praise God for the gift of our Faith!